This post is a first. That I am writing it from my Apple iPad is not the news. Blooging with the iPad is a bit of a pain, especially if you want to attach photos (which is, of course, what this blog is al about). No, the first is that I am composing it via a mini USB keyboard. 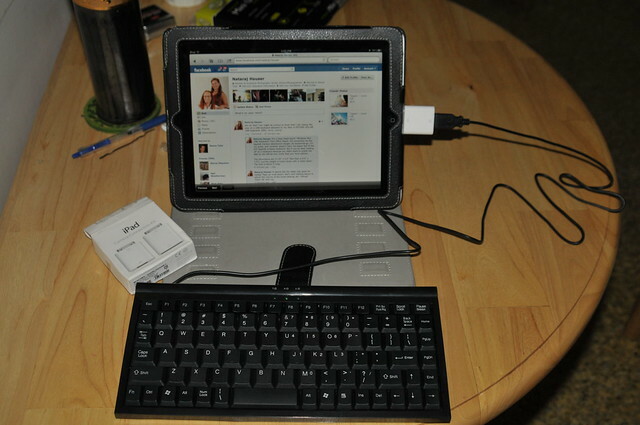 Yep, you read that correctly: I have a USB keyboard attached to my iPad. Impossible you say? Think again! Apple sells a "Camera Connection Kit" for the iPad that contains two dongles. One is an SD card reader for importing photos and video to the iPad. The other is a USB port for direct connection of cameras that do not use an SD card (like my dSLR that uses a CF card). While it is true that most USB keyboards draw waaaaay too much power for this connection (the iPad gives an error that the attached device draws too much power) there are a few no-frills keyboards that will work. The one I bought cost $15 at Office Depot. For the occasional use I think it will get, that is a perfect price! The brand is "Gear Head" and it was the last one in stock at my nearby store. When I looked online, it seem like it was readily available at Walmart and other stores (probably Amazon). 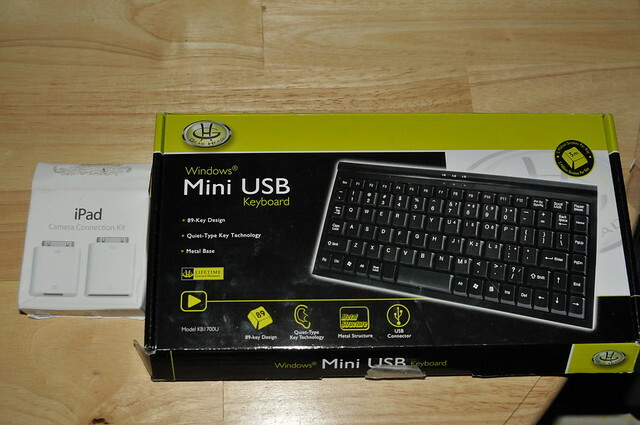 Look for the "Windows Mini USB Keyboard". If they make one for Mac, I did not see it. The keyboard is cheap: The action is not great, and coupled to the iPad it is really only good for typing. You will still be doing your navigating and volume control sort of tasks on the iPad. It gives me an "Unsupported Device" error when I connect it. Just ignore it. That is OK with me. For this price I can live with that trade. The keyboard is small enough to get stashed in my always-with-me bag that contains my camera gear and iPad, so the whole coffee shop experience just got a tiny bit sweeter. This post was done in my favorite coffee spot: My kitchen, with a cuppa and a cookie while I listen to my own tunes. iPad or iPad2? I don't have mine yet. What's this about keyboard using too much power? Is there no way to run the iPad off AC and then use any USB keyboard with this connection kit?